Anaphylaxis is a severe, whole-body allergic reaction to an allergen. Anaphylaxis happens quickly after allergen exposure, is severe, and involves the whole body. Anaphylaxis affects between 1.5% and 5% of people. Anaphylaxis - Different Causes. Click here to enlarge the image. 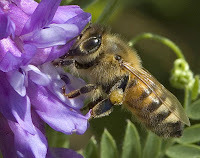 Image source: Bee, Wikipedia, GNU Free Documentation License.